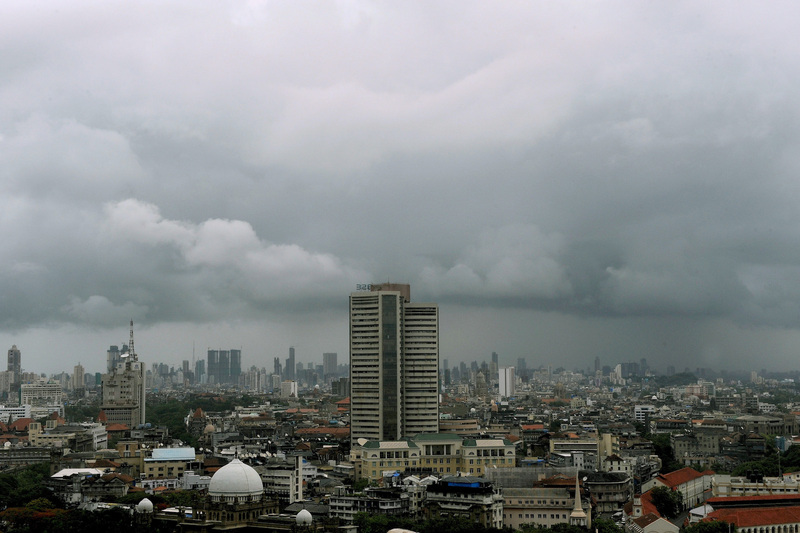 The skyline of Mumbai, India's financial capital. The private equity industry in India has undergone a seismic shift in recent years. The private equity industry in India has undergone a seismic shift in recent years. 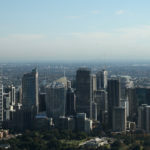 A booming modernizing economy has opened up new avenues for investment opportunity, a series of regulatory changes have made accessing private capital easier and more viable, and institutional investors are rapidly gaining size and expertise and are increasingly looking to private markets. This has culminated in a paradigm shift for the private equity industry in the country. Where once, private equity was a niche market mainly focused on attracting foreign investment, it is now emerging as an integral part of the domestic investment landscape and is particularly important as a source of finance for infrastructure, manufacturing and technology services alike. Preqin currently tracks 103 institutional investors in India that are actively investing in private equity. This lags behind the likes of China and Japan, but is at par with the number in Hong Kong and more than in Singapore. Considering that the latter two are both major financial hubs, this demonstrates that India’s investment landscape has seen rapid growth and development in recent years. This growth is based on two developments in the wider economy: increased agility and deal-making from corporations and the rapid accumulation of wealth among India’s elite. It is notable, for instance, that family offices and wealth managers comprise the largest proportions of India-based private equity investors—18 percent and 17 percent, respectively. This is unlike what is generally seen globally, where it is more common to see large institutions such as pension funds make up the bigger share of private equity investors as compared to private wealth managers. The next largest proportions of investors in India are banks (16 percent) and corporate investors (16 percent). Again, this is counter to what we see globally—banks in North America and Europe have been forced to keep private equity at arm’s length in the wake of the 2008 global financial crisis due to regulations like Dodd-Frank and the Basel Accords. Banks in India are much more active in the space, and corporations are actively targeting private equity investments as a source of potential deal opportunities and to provide long-term capital growth. The booming economy in India has been a driving force behind both of these trends. India is the fastest-growing major economy globally—the International Monetary Fund predicts that India will overtake the UK in 2019 to become the fifth-largest economy in the world. At the same time, changes to how alternative asset funds like private equity are regulated and taxed have fostered the domestic industry, allowing India-based fund managers to become more tax-efficient for investors and giving them greater opportunities to buy and sell domestic companies. As conditions in India have become more favorable, the number of domestic private equity funds has multiplied. The country now boasts 394 active private equity fund managers, more than any other country in Asia apart from China. Collectively, those fund managers have closed 105 vehicles since the start of 2015, securing almost $12 billion for private equity investments. 2017 and 2018 saw fund managers close more than 25 funds and raise more than $3 billion each year, more than in any year previously. This has enabled them to step up their deal-making—the period since 2015 has marked an unprecedented level of investment activity. 2015 and 2016 marked successive records for the number of private equity-backed deals announced—1,156 and 1,184 successively—while 2015, 2017 and 2018 all set new records for the total amount of capital invested. 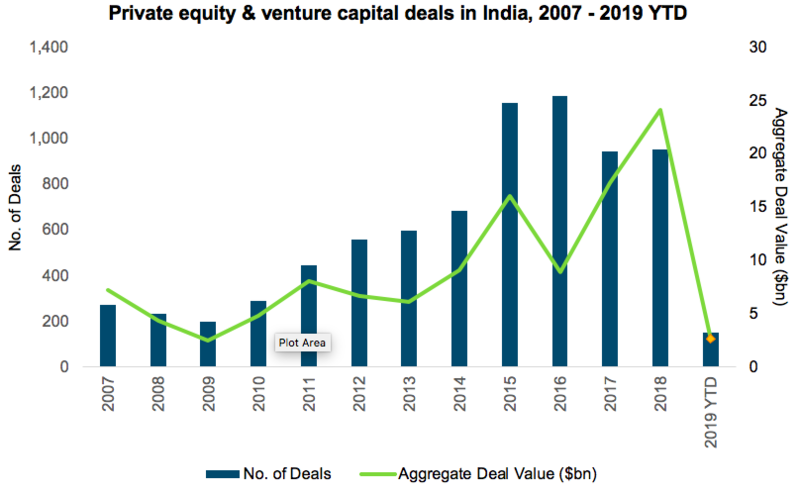 Overall, since the start of 2015, there has been $69 billion in private equity deals announced in India, more than double the amount invested in the preceding four years. Deal activity has focused heavily on venture capital funding, with funding rounds for startups accounting for nine out of 10 deals announced since the start of 2015 and 51 percent of the capital invested. This reflects the rapidly expanding and modernizing economy: India is home to numerous startups and small companies that are targets for venture capital funding, while hosting relatively few large and mature enterprises that might be sought by buyout funds. 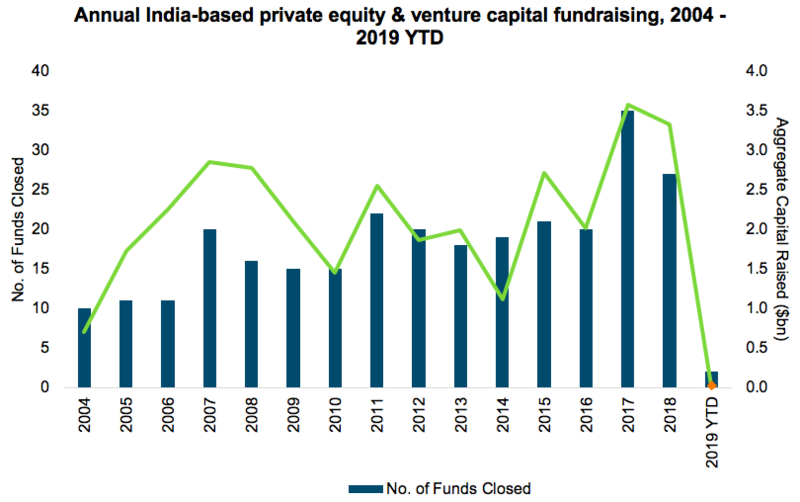 This is shifting, though—buyout funds spent $15 billion in India in 2018, more than double the amount seen in any previous year. Similarly, fund managers have been able to make many more exits from private equity-backed companies in recent years than they have before. There have been 776 private equity-backed exits since the start of 2015, with a total value of $58 billion. Of these, 57 were IPOs, which were worth a total of $5 billion—a sign that the private equity industry in India is finding it easier to make exits and is helping to drive the economy and wider Indian financial industry in its expansion. This clearly illustrates a maturing of the private equity industry in India. Successful exits have enabled fund managers to return record amounts of capital back to investors. India-based private equity funds have actually returned more capital to investors than they called up from them in each year since 2014, but distributions of capital to investors have boomed in recent years. 2016 alone saw private equity funds distribute more than $6 billion, proving a boon to investors that look to private equity as a source of returns. This has sparked a virtuous circle for the industry: Strong distributions of capital satisfy investors and increase their appetite—and usually their allocations—for private equity, but at the same time, reduce their actual allocations below target levels. Investors therefore recommit more capital to the industry in order to maintain their allocations and to take advantage of potential future gains, which fuels further growth. As such, the assets under management of India-based private equity funds reached a record $28 billion at the end of June 2018 (the latest available data), and show no signs of slowing. The second half of 2018 saw further strong fundraising and deal-making activity, which likely helped assets under management increase further, possibly breaking the $30 billion barrier. It seems certain, then, that the face of the Indian private equity industry has irrevocably changed. Aided by a friendlier regulatory environment and spurred by the multitude of opportunities available in the country, private equity activity has crossed a watershed and is now a major force in the Indian financial landscape. As more investors start allocating to the asset class, participation is set to increase further, and we could see growth accelerate in the years to come. It may not be long before Indian private equity firms surpass $50 billion, and there’s no telling where they may end up. 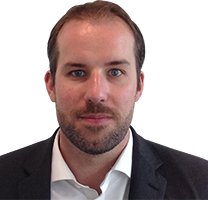 Christopher Elvin is head of Private Equity Products for Preqin. He joined Preqin in 2006, and is currently head of Preqin’s private equity products and responsible for Preqin’s market leading online products and solutions. 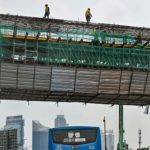 What’s in Store for Buyouts in Asia?